Malika Whitley on the TED stage. 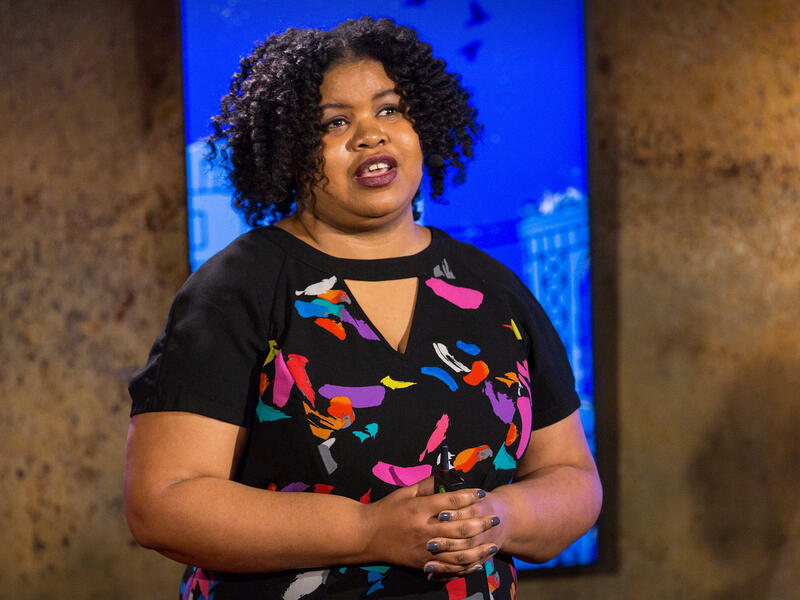 Malika Whitley is an arts curator, activist, and the founder of ChopArt, a multidisciplinary arts organization for homeless middle and high schoolers. Her inspiration stems from her own homelessness which she experienced first as a young child, and later as a teenager. During high school, she found the arts as a tool to combat the hardships that come with youth homelessness. On the show today, Hidden Potential - ideas about why we often pay attention to the loudest voices in the room and how we might try and find the people who get overlooked. MALIKA WHITLEY: Yeah, I definitely thought that's the way life is. RAZ: This is Malika Whitley. WHITLEY: I just thought, you know, it's fine. I'm a quiet kid. I get good grades. I don't get in a lot of, you know, disputes or anything. So it just, felt like, well, that's just how it is. RAZ: Malika grew up in Atlanta with two loving parents and siblings. WHITLEY: And just had a wonderful, enriching childhood. My sister is actually my best friend. I have two older sisters, so I'm the younger sister - bratty, you know, always getting my way type of person. RAZ: But when she was growing up, Malika's family actually struggled with homelessness. WHITLEY: I remember having trash bags and sleeping on couches. And I remember a lot of dark nights. But I also remember my family really taking a lot of care to make sure that we were well-nurtured and loved during that time. During my teenage years, though, my mom - that's when her psychosis and her mania really escalated. She would be on medicine sometimes, and that would pull her away from all the other aspects of her personality. And then when she wasn't on medicine, it would explode. And so it was kind of like a lose-lose. Either I don't have my mom in this way or I don't have my mom in that way. During my teenage years is when it really hit a fever pitch because every one of us had moved out of the house. And I was the last standing scapegoat. And it just became unbearable and just a little too dangerous for me to be there. And so I had to flee. RAZ: Malika Whitley picks up her story from the TED stage. WHITLEY: During my homelessness, I joined Atlanta's 3,300 homeless youth in feeling uncared for, left out and invisible each night. There wasn't and still is not any place for a homeless man to walk off the street to access a bed. I realize that most people thought of homelessness as some kind of lazy, drug-induced squalor and inconvenience. But that didn't represent my book bag full of clothes and school books or my A-plus grade point average. I would sit on my favorite bench downtown and watch as the hours pass by until I can sneak in a few hours of sleep on couches and cars and buildings or in storage units. I, like thousands of other homeless youth, disappeared into the shadows of the city while the whole world kept spinning as if nothing at all had gone terribly wrong. The invisibility alone almost completely broke my spirit. RAZ: Like, did anybody at school - like, when you would just show up to school as a high school student, did anybody know how you were living? WHITLEY: You know, that's so funny because so many - so my school, Washington High School, is located and a poor neighborhood. And so with my homelessness, it wasn't anything out of the ordinary. And it wasn't something that we really talked about because it was something that we assumed that people like us just experienced. And so that aspect really deterred me from telling my story for a very long time because I thought, there's nothing really special about this story; everybody goes through this. RAZ: I mean, you were a kid. You were a kid living that way. Like, nobody - certainly no children should have to live that way. And yet, you just thought this was just a sort of normal. This is, like, a way of life. WHITLEY: Absolutely. I mean, I remember when I got to college and I realized that I had never known someone who was not elderly to die outside of murder. Right? WHITLEY: And in high school, it was super normal to see people with airbrushed T-shirts with R.I.P. on it and for your friends to die and you to just move on, you know? And so homelessness felt indulgent for you to carry the trauma and let yourself feel that trauma. In spite of that, though, you're going to feel it. You know? It was very lonely. WHITLEY: It was very depressing. I remember, I would I ask my sister, who was really close to my mom, if my mom had asked about me - if she was wondering if I was OK. And she would say no. And how much of a dagger that was. RAZ: So how did you cope? What did you find that helped you deal with it? WHITLEY: Well, I coped then in, I think, an unconventional way. I really dove into the arts. And so it started off with poetry. I would just write in my journal. And then it expanded into singing, and I would just find different places where I could sing. And I ended up landing on this church. And they had really good acoustics in the basement. And so I would just go really early and sing in that church. And I think it allowed me to steal a few hours each day where I just felt normal. WHITLEY: Five years later, I started my organization ChopArt, which is a multidisciplinary arts organization for homeless minors. ChopArt uses the arts as a tool for trauma recovery by taking what we know about building community and restoring dignity and applying that to the creative process. ChopArt is headquartered in Atlanta, Ga., with additional programs in Hyderabad, India, and Accra, Ghana. And since our start in 2010, we've served over 40,000 teens worldwide. Our teens take refuge in the transformative elements of the arts. And they depend on the safe space ChopArt provides for them to do that. An often invisible population uses the arts to step into their light. But that journey out of invisibility is not an easy one. RAZ: I mean, it's almost like no one recognized your potential. You had to kind of just make it on your own. But it's almost like you decided that you were not going to let that happen to other kids, that you were going to devote your life to recognizing potential in kids who otherwise would be ignored. WHITLEY: Absolutely, absolutely. So many of our teens have come into the program, and, for the first time in their lives, they're able to express their trauma. And seeing the power of telling a teenager who is feeling absolutely alone that you see them is life-changing. RAZ: Yeah. I mean, why do you think it is that we - we understand that so many of these kids that you work with have incredible potential. Right? They could be - they could change the world. Like, well, they may be, you know, the next Einstein. And we would just - and in normal circumstances, they would be ignored. We would never know about them. They wouldn't be discovered. WHITLEY: Absolutely. I think that they go unseen, one, because of what we understand about homelessness. Right? So when we think about a homeless person, we don't think about the teenager who is living out of their locker. WHITLEY: ...Or being just completely, you know, outgoing and just, like, thrusting it in your face. A lot of times, that potential lives quietly. And it needs someone to nurture it and to value and validate it so that they can also see that potential. We can give them the validation that they need. And we can build them up in a way where they can be seen. And then they can go into the world and just give it their all. RAZ: Malika Whitley - she's the founder of ChopArt. It's an arts organization for homeless middle- and high schoolers. You can see her full talk at ted.com. On the show today, Hidden Potential. I'm Guy Raz, and you're listening to the TED Radio Hour from NPR. Transcript provided by NPR, Copyright NPR.